The Steam controller is looking more and more like a traditional controller with each redesign. Pretty much every single video game controller since the N64 has featured analog "thumb sticks", that making moving in 3D spaces considerably easier than other alternatives. So, you can understand the bemusement fans had when Valve first unveiled its Steam controller, which featured touch panels and trackpads instead of face buttons and analog sticks. The last redesign saw face buttons return, and now, though it still features its dual trackpads, a new redesign for the controller includes a traditional thumb stick. The image to the right, which was fished out of the Steam database by the folks over at SteamDB, shows the thumb stick in place of what was the d-pad in the prior design. Other than this addition, and a few "streamlining" changes, the controller is more or less the same as what we saw before. The controller was initially set to debut in November of this year, but was pushed back to 2015 so Valve could make further improvements to it. "[The Steam Machines hardware beta is] generating a ton of useful feedback, and it means we'll be able to make the controller a lot better. Of course, it's also keeping us pretty busy making all those improvements. Realistically, we're now looking at a release window of 2015, not 2014." The controller was met with somewhat mixed reviews from most of the outlets that managed to get their hands on it, with its signature trackpads being rather hit and miss. The addition of a thumb stick could be an appeal to the more traditionalist crowd. What do you think? Have you tried a Steam Controller? 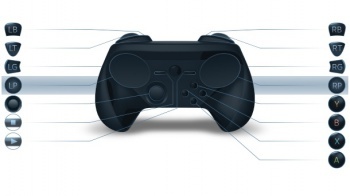 Do the trackpads work or should Valve have taken its cues from the old "if it ain't broke, don't fix it" adage?